E. E. Moffitt (Elvira Evelina), 1836-1930. The N. C. Society Daughters of the Revolution and Its Objects. From The North Carolina Booklet, vol. VI, no.2: 146-150.
supported the electronic publication of this title. The electronic edition is a part of the UNC-CH digitization project, Documenting the American South. The text has been encoded using the recommendations for Level 4 of the TEI in Libraries Guidelines. Original grammar, punctuation, and spelling have been preserved. Encountered typographical errors have been preserved, and appear in red type. Running titles have not been preserved. Spell-check and verification made against printed text using Author/Editor (SoftQuad) and Microsoft Word spell check programs. Women -- North Carolina -- History. National Society Daughters of the American Revolution of North Carolina. Women -- North Carolina -- Societies and clubs. Edenton (N.C.) -- History -- Revolution, 1775-1783.
revised TEIHeader and created catalog record for the electronic edition. finished TEI-conformant encoding and final proofing. THE N. C. SOCIETY DAUGHTERS OF THE REVOLUTION AND ITS OBJECTS. BY MRS. E. E. MOFFITT, REGENT. The Society "Daughters of the Revolution" was founded by Mrs. Flora Adams Darling, October 11, 1890 It was organized August 20, 1891 and was duly incorporated under the laws of the State of New York as an organization national in its work and purpose. The occasion of its founding was to provide a society whose terms of membership should be based upon direct descent from Revolutionary ancestors, in which organization admission upon collateral claims would be impossible. This rule, clearly stated at time of organization, has been rigidly observed, and the Society is justly proud of its membership, representing as it does the direct descendants of soldiers and statesmen of the Revolution. The distinctive feature of the government of the Society is its system of State Societies and local Chapters; the officers and Board of Managers of the General Society have entire superintendence and management of the whole organization, while subject to this oversight, State Societies regulate and direct their own affairs. A State Society may be organized wherever there are at least twenty members residing within the State, and a local Chapter may be formed by five members living in the same locality. The State membership includes all members of local Chapters formed in the State. the country's history, and to promote sentiments of friendship and common interest among the members of the Society." Founded by Mrs. Spier Whitaker, a lineal descendant of Wm. Hooper, a signer of the National Declaration of Independence, July 4, 1776, a biographical sketch of whose life by Mrs. Whitaker was published in the NORTH CAROLINA BOOKLET of July, 1905. The North Carolina Society was organized in Raleigh, Oct. 19, 1896, the anniversary of the surrender of Cornwallis; and a Constitution and By-Laws adopted on April 6, 1897, its declaration upon honor being, that "if admitted to membership in this Society I will endeavor to promote the purposes of its institution, and observe the Constitution and By-Laws." "Any woman shall be eligible who is above the age of eighteen years, of good character, and a lineal descendant of an ancestor who (1) was a signer of the Declaration of Independence, a member of the Continental Congress, or a member of the Congress, Legislature or General Court of any of the Colonies or States; or (2) rendered civil, military or naval service under the authority of any of the thirteen Colonies, or of the Continental Congress; or (3) by service rendered during the War of the Revolution became liable to the penalty of treason against the government of Great Britain: provided, that such ancestor always remained loyal to the cause of American Independence." should avoid all semblance of sectional feeling or political or religious partisanship. That such a society for women was needed is attested by its sure growth--its patriotic activity in marking Revolutionary sites, erecting monuments, the finding and preservation of records vital to the history of the Nation and which in many instances have been preserved from destruction through the efforts of patriotic Societies which had gained a knowledge of their value. The North Carolina Society grew in strength of purpose, more than numerically. Their meetings were held on important anniversary days--valuable historical papers were read by members on the Revolutionary services of their ancestors, all of which are preserved in our archives. tax had been removed by Parliament from these foreign commodities. On the reception of this news, obedient to the instinct of womanhood, ever ready to do her duty, a meeting was called to testify and put on record their adherence and co-operation in any movement for the peace and happiness of their country. Fifty-one ladies signed this document, an act which deserves an enduring monument. Ways and means for the accomplishment of this purpose were discussed, and, on motion of Mrs. Helen Wills, a committee of the following ladies was appointed to consider the matter: Mrs. Walter Clark, Mrs. Hubert Haywood, Miss Martha Haywood, Miss Grace Bates and Mrs. Ivan Proctor. 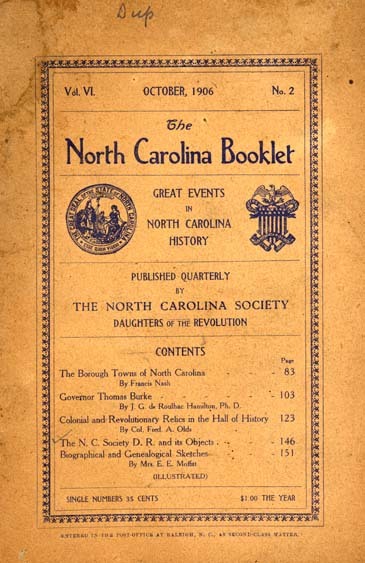 The committee reported at the next meeting that they would adopt a suggestion of Miss Martha Haywood to issue a monthly publication on great events in North Carolina history. The idea was adopted unanimously, and Miss Martha Haywood and Mrs. Hubert Haywood (nee Emily Benbury) volunteered to begin the enterprise. The treasury furnished means for issuing circulars, for postage, etc. Through the indefatigable efforts and enthusiasm of our Regent, Mrs. Whitaker, and her associates, "THE NORTH CAROLINA BOOKLET" has become an assured success. The first, number appeared in May, 1901, and consisted of a monograph by Maj. Graham Daves on Virginia Dare, she being the first English child born in America--"a fitting subject for a magazine issued under the auspices of the North Carolina Society 'Daughters of the Revolution,' edited by women, and the proceeds to memorialize the patriotism of women." After two years of arduous labor freely given to the cause, the editors resigned and were succeeded by Miss Mary Hilliard Hinton and Mrs. E. E. Moffitt. For the first four years the BOOKLET was published as a monthly, beginning in May each year. In 1905 it was decided to issue it quarterly, and the first number of Volume V was issued in July of that year. The subscription list continues to justify the publication, and the profits, therefrom have brought to the treasury of the Society a creditable amount. Having in bank a sufficient amount for the erection of the memorial, the accomplishment of its, object has been delayed in order to secure historical evidence beyond contradiction, that the heroic act of these patriotic women really took place. A correct list of the names of those who signed the document has been obtained, through the continuous efforts of Mrs. Spier Whitaker, who in correspondence with Rev. H. S. Iredell, of Tunbridge Wells, England, secured a correct list from the "Morning Chronicle and London Advertiser of Monday, January 16, 1775"; and through Mr. R. T. H. Halsey, a member of the Grolier Club of New York, and author of a late work entitled "The Boston Port Bill as pictured by a Contemporary Boston Cartoonist." Additional evidence has been obtained through Mr. Horner Winston, of Durham, N. C., now at Christ's College, Oxford, England, winner of the Cecil Rhodes scholarship. The plans are so far perfected as to insure the unveiling on the next anniversary. 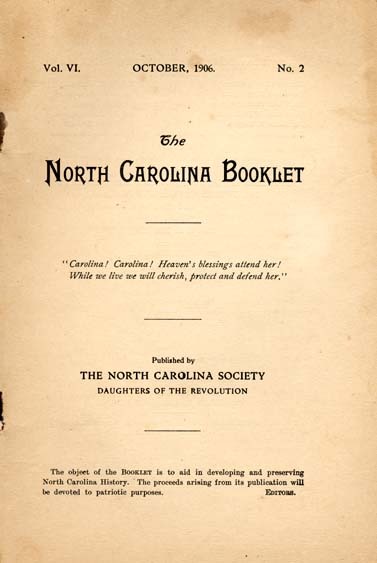 The North Carolina Society Daughters of the Revolution appeals to the patriotism of all descendants of those who will be commemorated and of North Carolinians all over the United States, to cooperate in the work of "rescuing from oblivion the virtuous actions" of their ancestors, and with such encouragement and cooperation the BOOKLET will continue to succeed in its work for other patriotic purposes.